Micheal Sean Winter is a popular blogger at the National Catholic Reporter who has a longstanding interest in the ways that evangelicals and Catholics have forged political alliances, especially in the 1970s and 80s. I first met Michael a few years ago when he visited Saint Francis University to deliver our annual "Ethics Lecture." I later interviewed him about his book on Jerry Falwell. 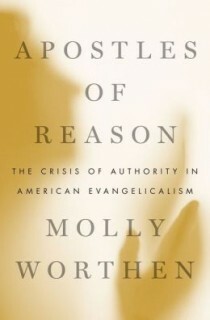 Perhaps not surprisingly, then, Michael's name came to mind after I interviewed Molly Worthen about her book Apostles of Reason. He graciously posted the interview to his blog and then went on to write a three-part review (one, two, and three). Worthen has made an invaluable contribution to understanding the recent history of American evangelicalism and, if you don’t understand something of 20th century evangelicalism, you don’t understand America, and you certainly don’t understand how Catholics often get tangled up in debates framed in terms quite alien to our tradition but touching on the core issue modernity poses to all churches, the issue of authority. That these important issues come with a prose that is light and lively is a further blessing. Hats off, ladies and gentlemen: A genius has entered the room and her name is Molly Worthen. I can only agree--fully and completely. Moreover, since reading Apostles of Reason myself, I have enjoyed and learned greatly from Professor Worthen's many other writings in places like The New York Times. My personal favorite is her reasoned and reasonable defense of the lecture in college teaching. "Listening continuously and taking notes for an hour is an unusual cognitive experience for most young people," she explains. "Professors should embrace—and even advertise—lecture courses as an exercise in mindfulness and attention building, a mental workout that counteracts the junk food of nonstop social media." Certainly not all of my colleagues agree with this. But Worthen presents a serious argument that we are wise to engage with, even when we hold competing views. The same is quite true of Apostles of Reason.